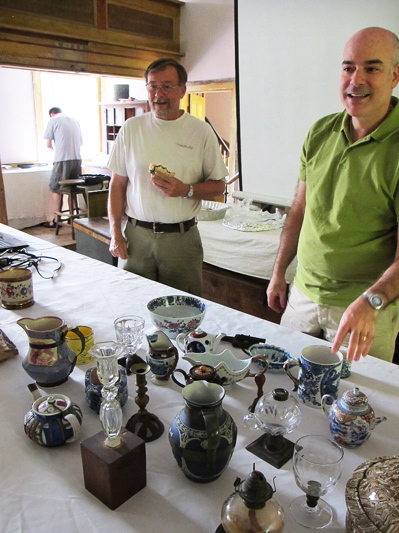 Last weekend I was invited to participate in the annual Ceramics Collectors, Collections, Connoisseurship & New Scholarship lecture series (aka “Dish Camp”), a 3-day event which attracts an international array of scholars, collectors, dealers and enthusiasts of antique china, porcelain and pottery. 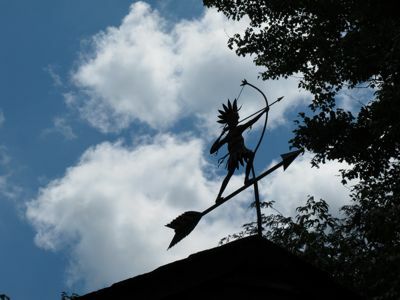 It is hosted by Don Carpentier, the founder and director of Eastfield Village, at his historic assemblage of antique structures, located in Nassau, NY. 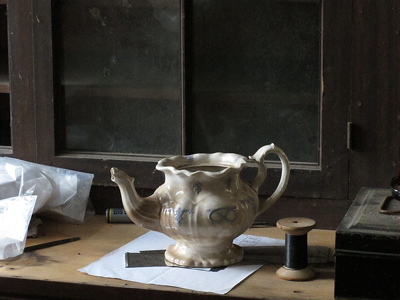 Don and I share a passion for historical antiques and period film set design & decoration, as we have each worked independently in both fields for many years. But unlike me, Don has practically and single-handedly moved an entire village worth of buildings, and in the process became an expert tinker, potter, mason, cabinetmaker, printer…the list goes on. I just don’t know how he does it all, and so stunningly well. And he’s a really nice guy! Don on the left, me on the right. Usually I’m the one eating something in every candid photo. As I unpacked examples from my collection and set them out on one of two 20′ long tables, already filled with other collectors’ wonderful ceramics and fragments, Don noticed a Staffordshire child’s mug with an unusual tin repair and informed me that it was made by a student of his who makes new tin repairs on damaged antiques. 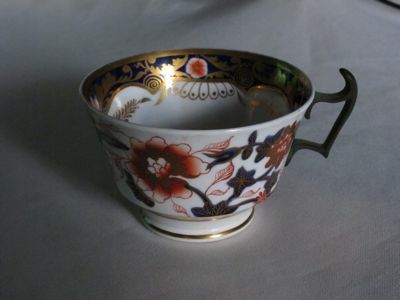 He spotted it immediately: the extraneous curly flourish at the bottom of the handle was the true giveaway. 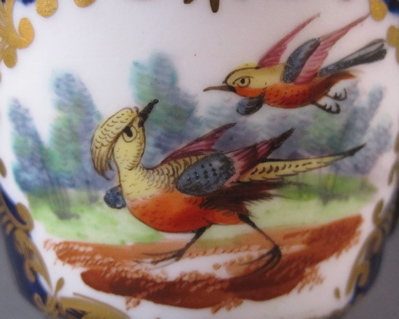 I purchased the mug from a reputable New England dealer a few years ago and I assume (hope) she didn’t realize the repair was contemporary. 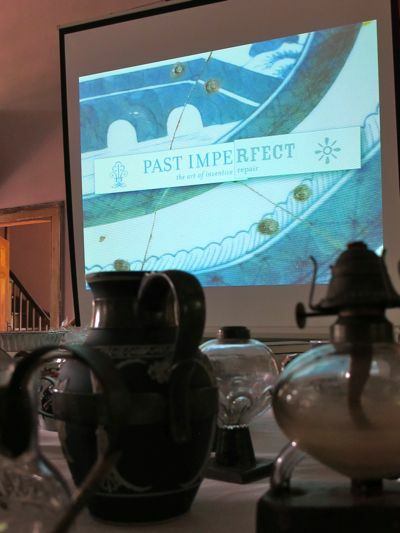 My first PowerPoint presentation (I know, welcome to the 1990s) was projected on a screen inside of the classic Greek Revival church (built in 1836 and moved to the village in 1978), with examples from my collection in the foreground. 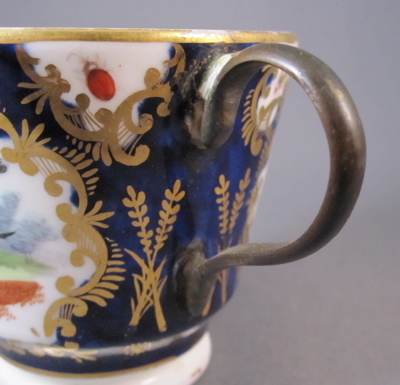 Attendees were encouraged to bring in inventively repaired antiques from their own collections, such as this English porcelain teacup with an early bronze replacement handle, which Don has owned since he was a teenager. I love how the delicate bronze replacement handle mimics the form of the original. 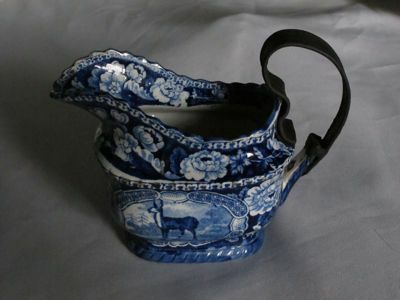 Another “dish camper” brought in this marvelous English transferware cream jug with a nicely formed tin replacement handle. 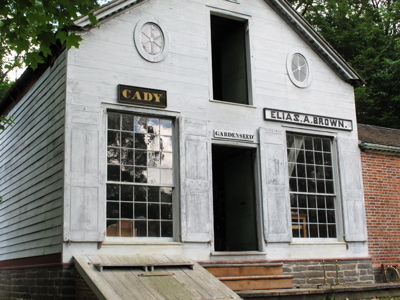 Starting in 1971, Don has moved over 20 original structures from the late 18th and early 19th century (board by board and brick by brick) from neighboring towns to his property, creating an entire village, complete with a Greek Revival church, tavern, blacksmith’s shop, doctor’s office, print shop, and general store (below). 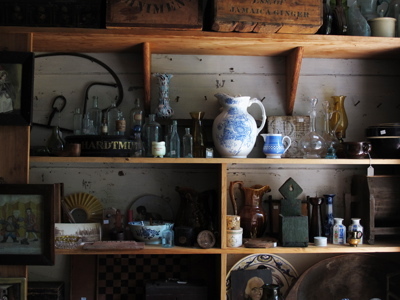 E. A. Brown’s General Store is filled with an eclectic assortment of antiques which are actually for sale, but sadly all items are in fine condition and there is not a “make-do” to be found. To be fair, Don has an affinity for items with early repairs and has his own collection, started when he was just 14 years old. Mark took this photo without changing or moving any of the elements contained within the frame. Each room of every building contains endless, perfectly placed tableaux, as if the original inhabitants still occupy the dwellings and are just beyond the camera’s reach. 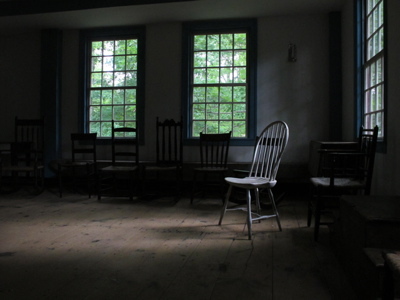 The second floor ballroom of William Briggs Tavern, dating from 1793 and moved in pieces from Hoosick, NY, contains a collection of mismatched chairs from the 18th and 19th century. The John Brooks House, also known as the “Little White House”, was remodeled in 1820. 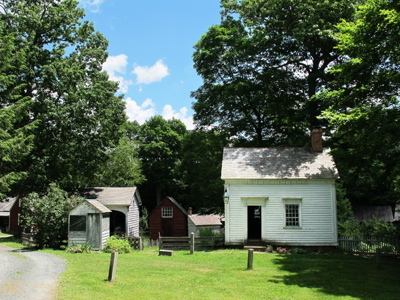 An early outhouse and a couple of small sheds are seen on the left. Mark and I are looking forward to returning to Eastfield Village later this summer to spend more time with Don, immerse ourselves in the art of blacksmithing or printing, and briefly live in his glorious antique lovers utopia. 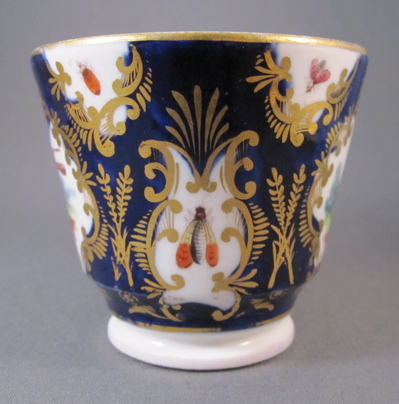 London shape porcelain cabinet cup, made by Coalport in the early to mid 1800s. 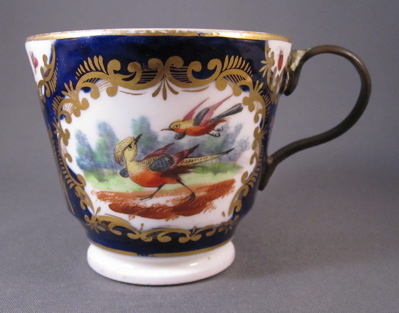 The Coalport factory was founded by John Rose in 1795 in Shropshire, a county in the West Midlands region of England. 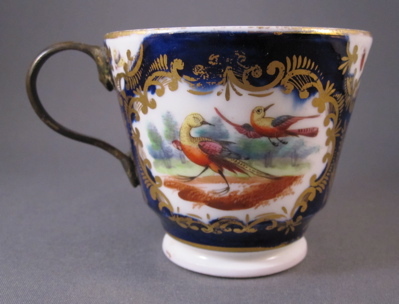 This example is superbly painted with angry looking birds & insects in panels surrounded by ornate gilt scrollwork and a cobalt blue ground. 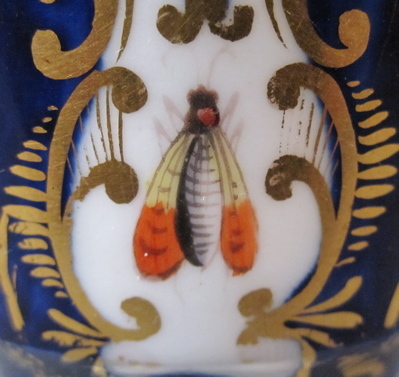 Measures 2-1/2″ high. 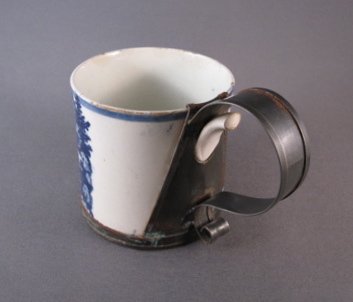 Delicately formed bronze handle replaces the long lost broken original which had the same simple loop shape.